Bad tackle or just pure violence? 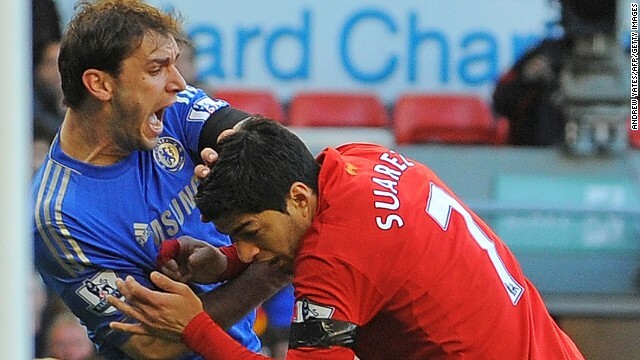 Luis Suarez's appalling lack of self-discipline handed the FA a golden opportunity to show they have teeth after all. Before the Uruguayan made a meal of Ivanovic's close attentions, football's governing body were looking distinctly soft on crime, soft on the causes of crime. It seems the FA, under the departing David Bernstein have washed their hands of anything ugly on the field, devolving all powers to the fallibility or otherwise of the referee and his assistants. Here's my open letter to Greg Dyke, soon to be incoming FA boss about how his new administration can make an impression on the game. I am sure you have a million and one things to do when you take over as Independent Chairman of the Football Association. The one thing you should do is address the perception of the FA as weak and worthless. A big job I know but there is one simple, effective and much-needed way to start. As you know there have been two recent examples of reckless and dangerous challenges going unpunished because the FA prefers the taste of sand to taking action. It is no way to govern the game. Sergio Aguero’s two footed stamp on David Luiz in the FA Cup semi final at Wembley last Sunday was petulant and a red card all day, every day. It happened right in front of an assistant and referee Chris Foy awarded a free kick so the match officials were therefore deemed to have seen the incident and the FA, using the excuse of not wanting to re- referee incidents, declined to do anything. Mind you Greg, they had little wriggle room after the scandal of allowing Wigan’s Callum McManaman to avoid punishment for what can only be described as an assault on Newcastle’s Massadio Haidara. Okay, so McManaman was making his first Premier League start but Haidara was lucky to emerge with no more than severe bruising. I suspect you shared the widespread disbelief when the FA claimed the match officials had seen the incident. Funny though how neither Aguero or McManaman were booked. Not funny actually; downright outrageous and both Foy and Mark Halsey, the ref at Wembley, should be embarrassed by their errors. You will know, of course, FA rules permit retrospective action if they are exceptional circumstances but this is the organization that refused to invoke that clause when, in November 2008, Sheffield United’s Chris Morgan fractured Barnsley striker Iain Hume’s skull. Hume was put into a high dependency unit, needed emergency surgery and spent nine months out of the game. It was a brutal and cowardly assault and the negligent FA did nothing, absolutely nothing to punish Morgan’s thuggery. Not exceptional apparently. So when you take office in July you might want to bang a few heads together, just hard enough to make General Secretary Alex Horne’s chins wobble, and sort this mess out. It would be a good start to your term in office and would send a message to fans and sponsors of your intent to make the FA’s disciplinary procedure fit for purpose again. May all your goals as boss, be screamers.